Armenia’s Ministry of Defense revealed numbers of the casualties in the recent escalation in Nagoorno-Karabakh. The report says the country lost 15 officers, 34 soldiers, 11 volunteers and 2 soldiers from the reserve. 1 officer is missed in action. Azerbaijani Defense Ministry spokesman, Vagif Dargahli, stated the Azeri side lost 31 military servicemen. It’s clear that this number is downplayed. The Azeri military stormed and seized strategic high grounds around Seisulan, Talish, Madagiz under heavy fire. According to experts, the Azeri casualties should be between 400 and 500 fighters. Some military sources say 600. Meanwhile, Azeri media are justifying the solution of the conflict by force, almost openly. Such glorification of the escalation points at its initiator. Kazakhstan’s President, Nursultan Nazarbayev, supported Azerbaijan’s actions strengthening rumors about the personal animosity between him and Serzh Sargsyan. Separately, Kazakhstan vetoed the idea to hold the meeting of the premiers of the Eurasian Economic Union (EAEU) in Yerevan. Turkey’s President also supported the Azeri actions and held a series of meeting with his Azeri and Kazakh counterparts demonstrating the solidarity. In turn, the US present a [fake] policy supporting Armenia in the recent escalation in order to force a wedge between Armenia and Russia which should be careful to avoid the regional conflict and save the influence in South Caucasus. US-sponsored Armenian media have been fueling anti-Russian speculations. The recent developments showcase a new attempt to increase the conflict to a regional level by the US which is interested to purge a strategic Russian military base from Armenia. On one hand, the US thrusted Aliyev forward to the conflict through Turkey. On the other hand, US diplomats condemned the escalation and supported the Armenian media campaign. In this situation, Russia is the main player which is interested and makes steps to keep the peace in South Caucasus. 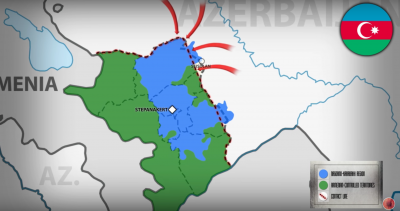 As any territorial conflict, which includes an ethnic factor, the Nagorno-Karabakh issue is unique. Indeed, it can’t be compared with a clear situation like for example Crimea which also found itself incorporated in a newly appeared state after the fall of the USSR. The Nagorno-Karabakh territory has faced a bloody civil conflict and the nations involved in it have a long history of engagement in the region.